It’s already mid-January and hopefully our 2015 resolve to improve our health this year is still going strong. Those who have resolved to begin or increase exercising will find that walking for fitness and weight management may provide some additional health benefits. A regular walking program can improve your mood, sleeping patterns and cardiovascular health, reduce the risk of developing type 2 diabetes, increase strength, balance and mobility and help you lead a healthier, longer life. Walking 10,000 steps a day, the approximate equivalent of 5 miles, will help you to achieve these benefits. The 10,000 step regime was originally coined in the 1960’s by a Japanese company as part of a marketing campaign to help sell pedometers. The 10,000 step program gained popularity in Japan and studies conducted since have found that people who regularly reached 10,000 steps daily did experience health benefits, especially cardiovascular benefits. The American Heart Association agrees that 10,000 steps per day is the number to reach in order to decrease the risk of heart disease and improve overall health. Walking 10,000 steps is roughly equivalent to the general health recommendation to perform moderate exercise for 30 – 45 minutes most days of the week in addition to being moderately active during the day. The average American adult going about their normal daily routine walks between 3,000 and 4,000 steps, well below what’s needed to improve health and fitness. One study showed we are thousands of steps behind the daily averages in other countries such as Japan, Switzerland and Australia. According to the National Institutes of Health, people who average up to 5,000 steps per day are considered sedentary, while those who average up to 7,500 steps are considered low active. To gain active status, 10,000 steps is required and those who go beyond 10,000 steps are considered highly active. So, the majority of us who are inactive or are low to moderately active would need to gradually increase our steps in order to reach our fitness goals of a minimum of 10,000 steps. To be sure, it requires commitment and a conscious effort to get 10,000 steps daily. The best way to track your steps is to invest in a pedometer. You won’t necessarily need a fancy one. An inexpensive one that tracks steps only is sufficient for this exercise. Wear your pedometer from the time you wake in the morning until you go to bed at night and record your steps every day for one week to get your daily average. Then gradually increase your daily steps each week until you reach the goal. One good way to accomplish this is to add 500 steps daily for one week and then do the same over the next several weeks to slowly build up to 10,000 or more steps. To lose weight, you need to increase your physical activity and reduce your caloric intake. The number of calories burned per mile is dependent upon your current weight and your walking speed. A general rule of thumb finds that you will burn 70 – 100 calories per mile walking at a moderate pace of approximately 3 miles per hour. At a moderate speed, your body burns calories efficiently. Higher walking speeds burn extra calories, as more muscle groups are engaged. However, it’s best to start out at a slow to moderate speed and increase distance before working on speed. And be patient too, as to lose one pound weekly, you will need to burn 3500 calories. That means taking in fewer calories and/or increasing your calorie burning activity by 500 calories each day. Adding enough exercise to burn 300-400 calories is a good goal for a sustained weight loss plan that includes reducing your caloric intake by 100 – 200 calories daily. To set yourself up for success, start with a simple goal, such as walking for 10 – 15 minutes at a specific time each day. Once you are an experienced walker, you can burn more calories by adding hills or climbing stairs. If you are working out on a treadmill, gradually increase the incline or follow the hill workouts built in to the treadmill. Changing up your pace and adding intensity will also burn extra calories. 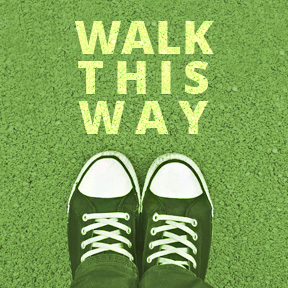 Do this by walking as fast as you can for a minute or two and then slow to your usual pace. Repeating this several times throughout your walk will increase your ability to walk at a higher pace and allow you to walk a greater distance in the same amount of time. Be sure to invest in good quality shoes. Warm up by walking at a comfortable pace for 5 – 10 minutes, cool down the same way at the end of your walk and do some light stretching when you are finished. Walking with a friend or a group may make the walk more enjoyable and help to keep you accountable. And most of all, persevere! Walking has the lowest physical activity dropout rate. If you find yourself skipping or making excuses, get back on track and remember your goals – getting in better shape, enhancing your mental wellbeing and taking charge of your long term health. This entry was posted in Home and tagged 000 Steps, 10. Bookmark the permalink.